« Traditional Wiltshire Varieties – sources please? Plum Rootstock Junction: is there any problem? For a number of years I have been thinking about planting a new plum tree and have been tempted by the luscious apricot-like Coe’s Golden Drop which was a prized dessert fruit in Victorian times but I have been deterred from choosing this variety because of its reputation as a shy bearer. However, I became convinced that this was the one to have when I went on walk through the National Plum Collection at Brogdale with the Friends of the National Fruit Collections last year: the two Coe’s Golden Drop trees there were festooned with hundreds of golden plums. In November 2011 I took delivery of a Coe’s Golden Drop one year maiden whip on St Julian A rootstock and, three days, later it was in the ground. In December (about a week after planting) I noticed that the bark at the top of the rootstock near the junction with the scion wood appeared damaged. Another photo taken last week (20 January) seems to indicate that this the damage has progressed and that the bark is peeling. 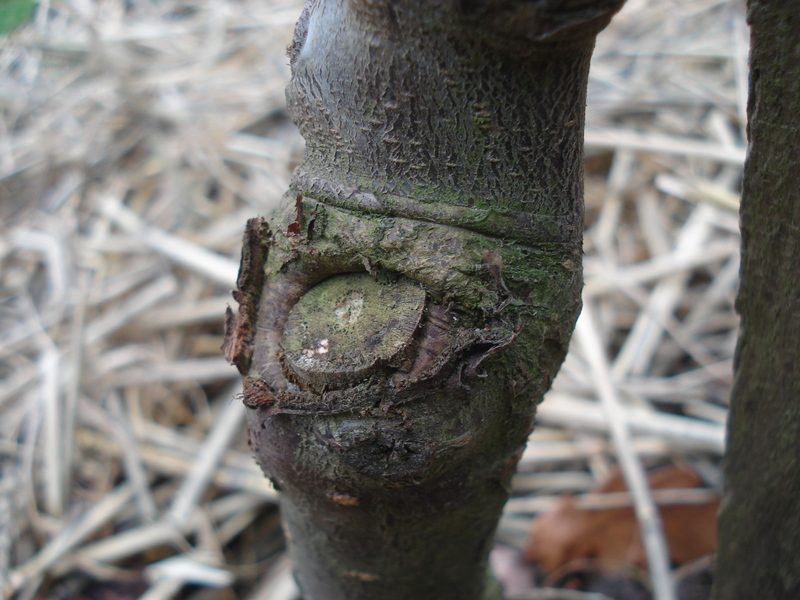 I have contacted the nursery which supplied the tree but they say that this is normal: what I think is damage is where the bud graft was over-cut last spring and that in a couple of years the trunk will grow over it. However, I still have concerns that this separation of the bark from the trunk will provide an entry point for disease. I wonder if any of your readers is able to advise me. Let me first of all declare an interest in this question for the benefit of other followers of the blog namely that the tree in question was supplied by my nursery. What is the nature of the damage? 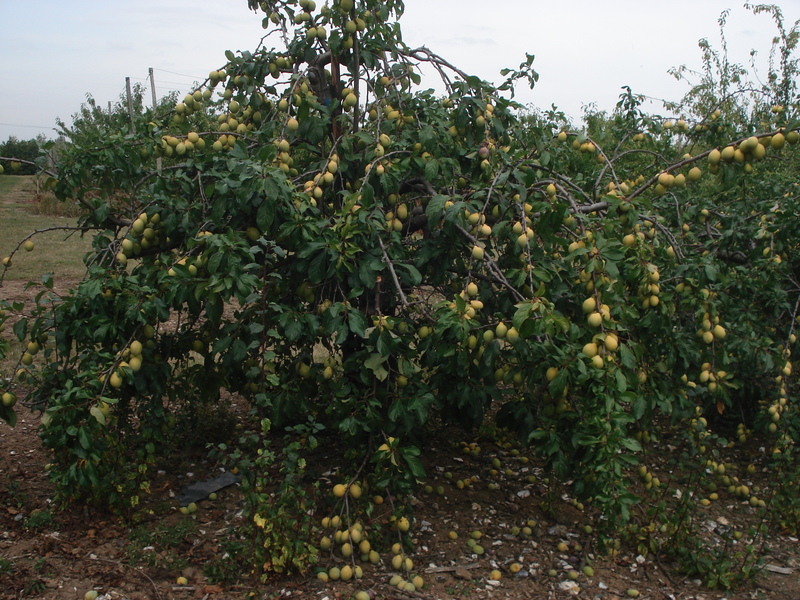 This plum tree like most other fruit trees has been produced by bud grafting. A single bud of the required variety is grafted onto the side of a rootstock in late July or early August. 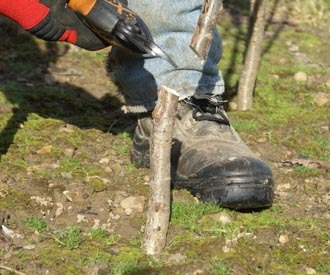 The following March the rootstock is cut immediately above the grafted bud leaving a six inch stump. The grafted bud then starts to grow producing a tree which will be ready for sale as a maiden tree in the autumn. 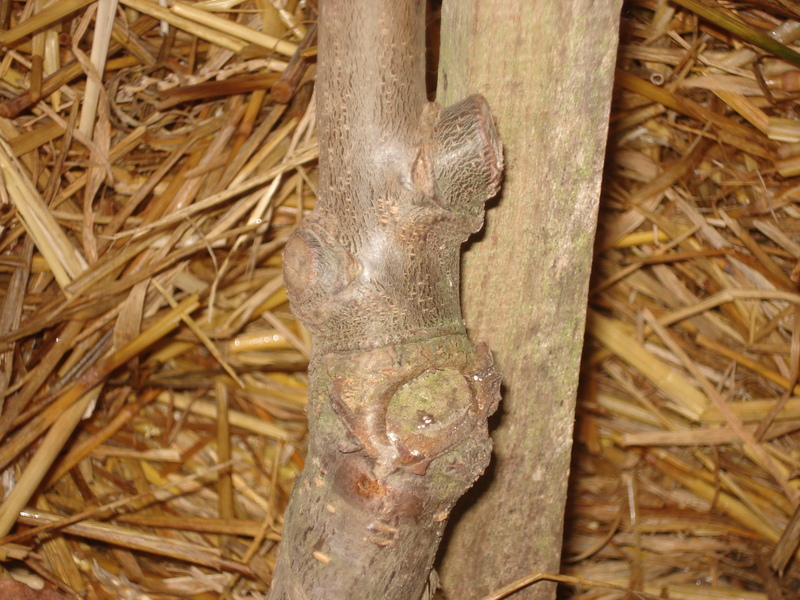 The bud is on one side of the rootstock and as it grows the new growth gradually starts to grow over and cover the cut end of the rootstock from that side. The opposite side will continue to remain an exposed cut as growth from below is slower. By the end of the first growing season you would normally expect to see the cut end looking like your photos with part of the cut end covered by the new growth from the bud side and a lip of new growth around the back side of the cut. After about three years, new growth from both sides will meet and completely cover the cut end. Like any scar the cut end of the rootstock never looks pretty. There is always a small amount of dieback of cambium layer (the living tissue between the outer bark and the inner wood) immediately below the cut. This will become jagged as it dries out and is pushed away by the growing tissue from below. This is the “peeling bark” that you are concerned about. You can still see remnants of this on a two year old tree. You say that the damage appears to have progressed between early December and late January. It is very difficult to compare your two photos as the second is taken in much poorer light and from a different rather less flattering angle. In any case any change that could possibly have occurred during that period could have only been as a result of normally weathering of dead tissue around the cut rather than progression of any disease. Even diseases are dormant in the middle of the winter. What you need to be looking at to determine the health or otherwise of the graft union is first of all how well the scion has grown. In this case the scion is already as thick as the rootstock which is sign of excellent growth. Secondly, you need to look at the health of the wood around the cut. Again looking at your photo, the swelling around the edge of the cut forming a lip of growing tissue is good indication of healthy new growth. Peeling bark is only a sign of problem if it is accompanied by a softening and discolouration of the underlying wood indicating signs of disease in the living cambium under the bark. I don’t think there is any sign of that in this case. What is the risk of disease entering the tree as a result of the damage? Or for that matter more generally through any wounds or damage? Some diseases do infect plants through wounds or other physical damage. However most enter through perfectly healthy and intact tissue. In fact contrary to what may be a commonly held view, entry of disease through damage and wounds is relatively rare. Our day-to-day gardening experience should tell us this. We inflict wounds on plants on a regular basis “for their own good” – we prune trees, mow grass and trim hedges – yet they generally survive and thrive despite all the damage inflicted on them. Even diseases that we normally associate with wounds and damage, most commonly infect through less obvious natural “wounds”. Take the example of apple canker which people often associate with pruning. In fact unless one totally ignores basic hygiene rules, spreading canker through pruning is relatively rare. By far the most common route of infection is via the tiny scars produced when leaves fall in late autumn or bud scales are discarded in early spring. It makes sense: the organism which causes the disease will have evolved to take advantage of naturally occurring events which occur with seasonal regularity rather than a random event such as a pruning cut or other injury. Not surprisingly the main releases of airborne spores which carry the infection occur in late autumn and early spring to coincide with leaf fall and bud break. Where infection does take place through a wound or other physical damage it can usually do so through freshly inflicted damage within the first few hours. Disease organisms are parasites which live on living tissue. A wound causes rapid death of the tissue around creating a hostile environment for most disease organisms. In fact a very common defence mechanism of plants against disease called hypersensitive reaction, involves mass suicide of the tissue surrounding an infection thus isolating and preventing the spread of the infection. The shot-hole effect produced by bacterial canker on plum leaves is a graphic example of this. Your plum tree will be under attack by many disease organisms throughout its life. Don’t be alarmed – this is quite normal and a healthy tree will be well capable of withstanding these attacks. Infections will occur through perfectly healthy leaves, young shoots, buds opening in the spring, leaf scars etc. but almost certainly not through the damage you are concerned about. The remnants of a well healed cut nearly a year after the cut had been made is a very unlikely entry point for disease. Thank you for a comprehensive and informative reply. I am greatly reassured by the information you have given and I am now looking forward to nurturing a healthy tree.